Changing the look of a room is as easy as changing a light. If your space feels a little cramped, but moving or renovating is out of the question, try upgrading your recessed lighting or installing a track lighting system. This will brighten any room and even make your space appear larger! Forget about the clunky, chunky track lighting from the ’60s and ’70s. Now there are a lot more choices: track heads are smaller and available in traditional styles in a variety of finishes. Recessed lighting is also available in different finishes, such as brushed nickel and bronze. Recessed fixtures are perfect for illuminating otherwise dark spaces where portables and direct-mount fixtures have limited capabilities, and would visually clutter the design. They offer flexibility because they can be individually aimed. To save energy, compact fluorescent light (CFL) bulbs are available for recessed fixtures. Placing the lights on a dimmer will cut electrical costs even more, and create ambiance by varying the levels of light. Track systems have evolved into highly decorative and functional lighting solutions. Almost any room is a candidate for a track system. When the lighting placement is limited by the location of electrical service in the ceiling, track lighting is a good choice. Because the track allows for multiple fixtures in a linear configuration, it’s possible to provide electricity to the track in one spot while allowing the fixtures on the track to reach many parts of the room. As temperatures drop, no need to turn off your ceiling fans – just turn them around. Using the reversible blade option in winter provides a means of circulating the hotter air that rises to the ceiling. This helps save on heating bills when the weather gets cold. What’s the best fan blade size for your room? A good rule of thumb is a 36- to 52-inch diameter blade sweep for rooms measuring 200 square feet or less. For rooms 200 to 400 square feet, a diameter of 52 inches or greater is recommended. If the space is more than 400 square feet, two or more fans are needed. Put down the paint cans and step away from the wallpaper. You can completely change the look of a room with a few simple updates. Typically, lighting in the dining room centers on the chandelier, and there are inexpensive ways to enhance that focal point. 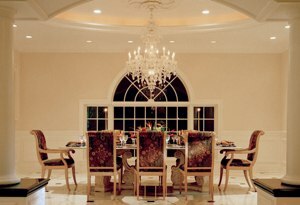 If a new fixture is not needed or not feasible, add a pair of miniature recessed lights placed to either side of the existing chandelier that shine at a 45-degree angle into the sides of the fixture. By lighting the glass or other material from a different angle, you’re making lighting an accent to another piece of lighting. Two decades ago, the most popular overhead fixture in kitchens was the recessed can. Today, options abound for replacing those fixtures with pendants. Add mini pendants over an island or counter, or larger pendants over a nook. The fixtures can also be used to divide the space into zones of work, eat and play, and materials can complement the appliances and other accessories in the space. The first thing you see when you enter a bathroom or powder room is the light fixture. When you walk into a dark room and flip on the switch, the light fixture sets the tone for the room. By simply replacing an outdated fixture, you can give your bathroom a whole new look. At the very least, put the light on a dimmer for added versatility and a dramatic effect. If there’s just one room in which you can replace a fixture, do it in the bathroom for the biggest impact. To find lighting fixtures to highlight your home’s décor while meeting your budget, click here to find an ALA member lighting showroom near you.